I Dream of Pinkie has been switched over to 5/8" general heading in anticipation of more colors! 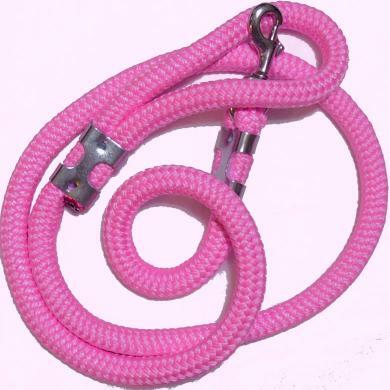 These 5/8" Braids are made of nylon and polypropylene. They are exceedingly strong while still being easy on the hands and stylish. THEY FLOAT! As with our other leads, the standard length of this lead is 5'. Short leads subtract from the cost. We make our 1' leads as traffic handles now. They have a snap and one clamp with a nice big loop. See Length menu below. To see our steel rope clamps and steel bolt snaps, please click here. No Brass Clamps on this rope (it is too thick).